I found a coffeehouse on the corner of Brick Lane and Bacon Street. It has free wireless and all kinds of sofas and chairs to lounge in so I did this for hours after buying my large white americano. When I told Joanna how long I sat there, she practically beat me with the end of her umbrella for being such a terrible customer. But! I tried to defend myself. It's a huge place and it was busy and people were in and out all day and there were a million other people camped out with computers. "They're doing great business!" I said, defensive. Joanna shot back something Englishy and aghast like, "Harumph! No thanks to you lot." I took this opportunity to deal a semi-low blow, considering the fact that she's raising a 2-year-old and not able to spend entire afternoons staring out coffeeshop windows, picking scuz out of her bellybutton and writing about it on the internet. "When is the last time you even WENT to a coffeeshop? That is what you DO." She wasn't having it and said if she were the owner she'd give me dirty looks and whisper behind my back. I don't think those are especially powerful deterrents but I concede that owners could demand more from customers or at least offer more expensive food or alcohol that has a higher markup than a two pound cup of coffee. But I said to her that it's true, no one wants to hang out somewhere where the people working are rude. There's too many other places to go. I also reminded her that we used to do the same thing when we were high school seniors. "Don't you remember going to Kaldi and Highland in Cincinnati?" 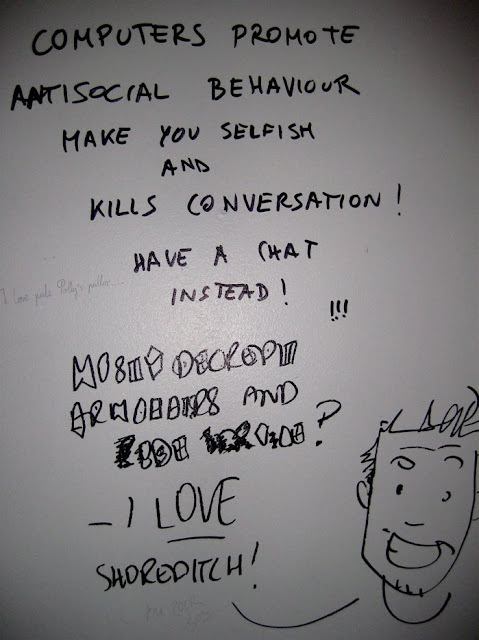 I returned to the corner of Brick and Bacon today and saw this graffiti in the bathroom. It reminded me of a few things. When I was draining cup after cup of coffee in those Cincinnati coffeeshops, I was never on a computer. That was before I even knew what email was so unless I was writing a paper or studying flashcards for an AP exam, I was talking to people. Maybe I didn't drop a lot of money but I was more sociable. With people in my ACTUAL, not virtual, presence. And I don't really feel bad about this but I did read a blurb in the free daily London newspaper about internet addiction, written dramatically with references to studies and authorities and REHAB. Yeah, there are a couple of other issues in my life I'd address before looking into cyber rehab. So what if I have to tell myself as a house guest, "Do not get your computer out right now. Wait until they go to sleep. They will think you are a jerk"? So what if Alfie walked into the room yesterday and said in gibbery baby talk, "Jess 'puter"? "Did he just say Jess's computer?" I asked. "I don't like that," I said.